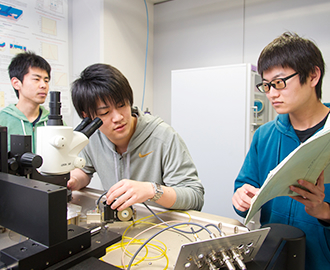 Professor Miura’s field of specialty is physics for electronic devices. Her research laboratory is known as one of the top laboratories in the world for research on global standard transistor models. Transistors are semiconductor devices with an amplifying function that uses the properties of a semiconductor. “Transistors are used in a variety of different things, such as televisions and cars. For example, to move a car you need a motor. ‘Functions’ are what we call the things that enable that motor to work smoothly, without waste, and a ‘circuit’ is what makes those functions. Through circuit design, we create various combinations of transistors and functions”, she says. ‘Model’ is the name given to the formula that describes the properties of a transistor – in other words, what each transistor does. Professor Miura produces such models for the rest of the world. She says, “Many industries are using the models that we developed here. They’re used not only in Japan but all over the world”. 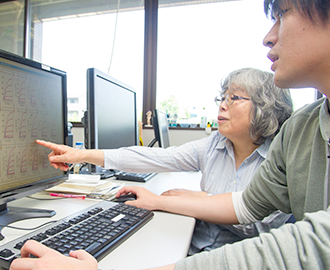 In addition, Professor Miura collaborates with business partners in a wide range of research on next-generation devices, such as the development of transistors for the full recycling of energy. Professor Miura was involved in the inception of the Taoyaka Program, and for that reason has a particular interest in achieving the ideals set out by the program. “I actually went to India, and I think it’s wonderful. Time passes by very serenely. In that red land, the people there speak so enjoyably about their ideas. The people in the incredibly poor areas of India speak so happily. There’s something special there. I really thought it was wonderful…” she says. On the other hand, she also made another point. “We are in contact with depopulated areas in Hiroshima, and the people there are scared. They’re scared because the culture that was there is being swallowed up by development in Japan overall”. Culture means something that lives in that area. It is the reason for those people to live, she says. “So the aim of integrating the humanities and science is to provide support for cultural independence. Naturally culture has a direction, and it had different ways of thinking. 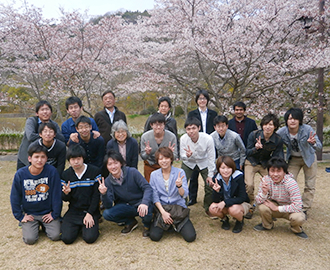 So together with the students, I want to learn about how to accept various ways of thinking”, says Professor Miura. 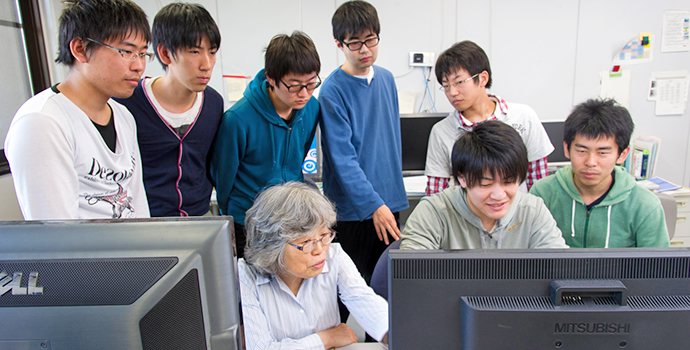 In the Taoyaka Program, Professor Miura teaches a semiconductor-related subject. However a major topic in her education and research is how to make use of state-of-the-art research in disadvantaged regions. According to Professor Miura, to prevent depopulation, there are three conditions: information, transportation and energy. As she believes that it is necessary to increase the number of regions that have secured these three conditions, she plans to examine the topic of securing energy. “Disadvantaged regions tend to be thought of as low-tech, but that’s not the case – we try to find a direction that is different from the mainstream. It doesn’t have to be the top product – I think we can achieve a lot by making adjustments to the system in terms of circuits”. Professor Miura says that for that purpose, at this point in time she would like to make a contribution using solar cells. Professor Miura urges the students to actually try living in the region and think about it themselves, hoping that they will at the same time learn to adopt a regional perspective.